This example shows how to calculate capital requirements and value-at-risk (VaR) for a credit sensitive portfolio of exposures using the asymptotic single risk factor (ASRF) model. 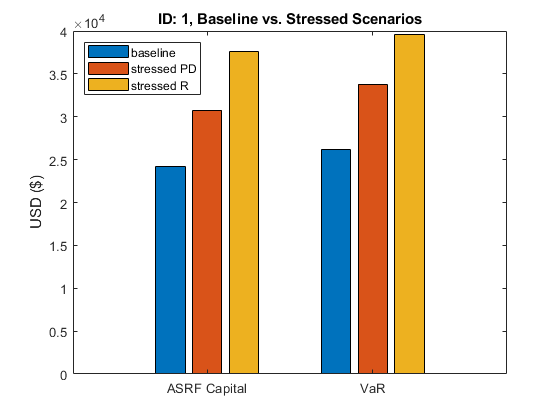 This example also shows how to compute Basel capital requirements using an ASRF model. The ASRF model defines capital as the credit value at risk (VaR) in excess of the expected loss (EL). where the EL for a given counterparty is the exposure at default (EAD) multiplied by the probability of default (PD) and the loss given default (LGD). To compute the credit VaR, the ASRF model assumes that obligor credit quality is modeled with a latent variable (A) using a one factor model where the single common factor (Z) represents systemic credit risk in the market. The portfolio contains 100 credit sensitive contracts and information about their exposure. This is simulated data. The asset correlations (ρ) in the ASRF model define the correlation between similar assets. The square root of this value, ρ, specifies the correlation between a counterparty's latent variable (A) and the systemic credit factor (Z). Asset correlations can be calibrated by observing correlations in the market or from historical default data. Correlations can also be set using regulatory guidelines (see Basel Capital Requirements section). Because the ASRF model is a fast, analytical formula, it is convenient to perform sensitivity analysis for a counterparty by varying the exposure parameters and observing how the capital and VaR change. The following plot shows the sensitivity to PD and asset correlation. 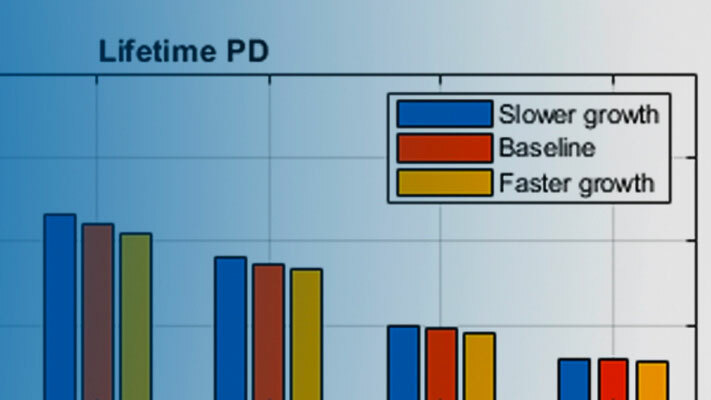 The LGD and EAD parameters are scaling factors in the ASRF formula so the sensitivity is straightforward. When computing regulatory capital, the Basel documents have additional model specifications on top of the basic ASRF model. In particular, Basel II/III defines specific formulas for computing the asset correlation for exposures in various asset classes as a function of the default probability. Find the basic ASRF capital using the Basel-defined asset correlations. The default value for the VaR level is 99.9%. Additionally, the Basel documents specify a maturity adjustment to be added to each capital calculation. Here we compute the maturity adjustment and update the capital requirements. Risk weighted assets (RWA) are calculated as capital * 12.5. 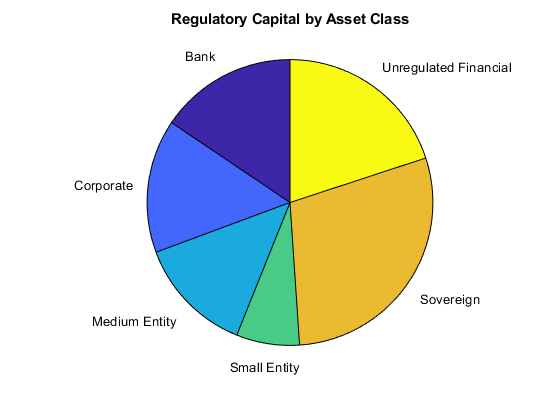 Aggregate the regulatory capital by asset class.